Isaiah Thomas devoted substantial space in The History of Printing in America (Cat.9) to a history of American serial publications, closing with an eight-page census of newspapers “Published in the United States in the beginning of the year 1810.” Thomas sought help in its compilation in March 1810 by placing a widely reprinted notice in The Massachusetts Spy, requesting publishers “to forward one or two of their papers … that the right titles of their several Newspapers, may be correctly inserted.” Many responded, and the newspaper issues sent to Thomas were later donated to AAS. This example — the first and only extant issue of the first Michigan newspaper — arrived too late for inclusion in Thomas’s checklist. The manuscript notation on the side reads, “Utica, (N.Y.) Aug. 3d 1810. Mr. Thomas, Sir I send you this paper printed by a friend of mine to insert in your ‘History of Printing.’ If he sees your advertisement, he will send more, perhaps of a later date. Your obt. Servt. C.S. 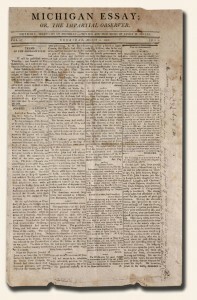 McConnell.” The Michigan Essay was printed by James M. Miller on Michigan’s first press, brought to Detroit from Baltimore in 1809 by Father Gabriel Richard. Most of the text is in English, but a few articles and advertisements are in French.